Although we're still a few months away from having a new home, I've begun dreaming up my new sewing room. After spending some (too much) time on Pinterest and Flickr (and zillow....), I've come to a few conclusions. 1. My personality doesn't match my decorating style. I don't know if I phrased that right. I'm fairly tight-wound. I'm not a partier. I like planning and lists and things that are neat and orderly. I realigned all the desks in my classroom every afternoon before going home. I have systems in place for things. My husband even lets me know when he "puts things where they go." That's not to say I'm not a fun person! I'm just particular. And quirky. And systematic. In high school I put glow stars on the ceiling and made sure that they were spaced evenly. Geez!! But I find that when I look at pictures of homes, I'm drawn to the ones that look easy and lived in. Ones with a collection of things on the wall (I rarely hang pictures, even though I have tons!). White walls and bright colors. 2. I like messy fabric stacks! 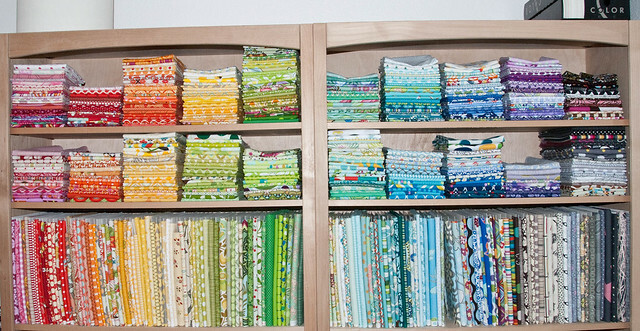 Call me crazy, but I prefer the look of haphazard stacks of fabric over super neat and organized. See point 1. But this is how I prefer fabric to look. It looks more natural and lived in. This is good because it will save me loads of time when it comes to folding new fabric and putting it away! 3. White & wood please! And some windows too. My current sewing room has 2 windows, so it's the brightest room in our apartment. These rooms are VERY different, but so similar too. They make me happy. What do you prefer? Do you decorating preferences match your personality? I enjoyed reading your post. I love to see other people's decorating style. My style: none! I am waiting for my kids to get a little older before I even bother. It sounds defeatist, but really, it keeps me from being disappointed when my couch cushions are cut open by a 2 year old with scissors, or my 5 year old colors as hard as she can on the office carpet with several different crayons. My husband always gives new parents the same advice: just capitulate. Go on the assumption that everything in your house has already been destroyed/is trash, and you won't get upset when a kid ruins something. So, our house is clean and sometimes neat, but there's really no style to it at all except in our one living room that was repainted and got new furniture three years ago, but is still referred to in conversation as "the new living room." If I had a style for my sewing room, it would probably be coined "modern cottage." I agree lots of windows, and I would like a mix of wood furniture with modern lines and some repurposed/repainted antique furniture and maybe a pie safe. I've always wanted one, but my husband would probably never let one in the house unless it was going in my office and he wouldn't have to see it often! I have no clue if mine do or not. I've never really decorated since I always know we'll be moving so I don't see the point. Maybe I'll figure it out when we move (hopefully for the last time) next year. Oh, I've got you beat on the starts thing--I put glow stars up in constellation patterns!